Ranch homes began their history in 1920s America, but soared in popularity in the 1950s and 1960s as more people started building their own homes. Often called California Ranch Homes, Ramblers, or Ranchers, there are several key things that make a Ranch style homes exterior such a popular design. Dramatic entry - whether it's stairs with a mighty balustrade leading to the front door, an arch, or a huge monitor over the doorway, entries to Ranch style homes are always dramatic. Natural materials are used, such as oak and brick. However, brick Ranchers are usually covered over and everything is painted. Long layout with low pitched roofs. 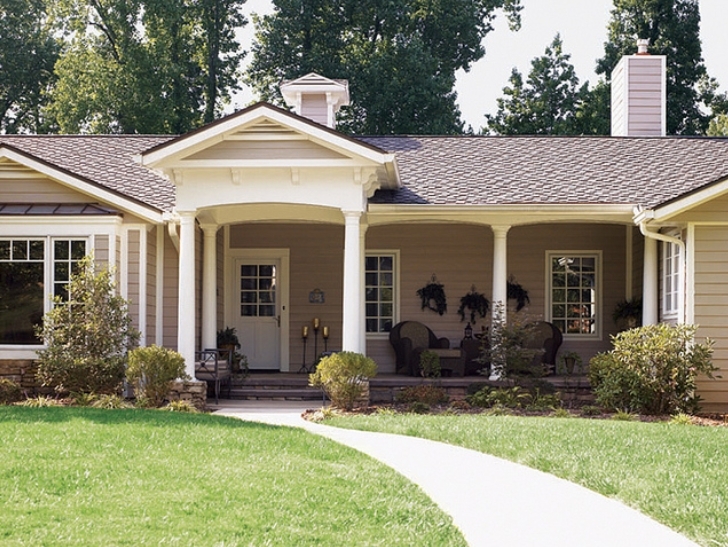 Covered porch/entry - can extend along the front and side of the house as a long veranda. 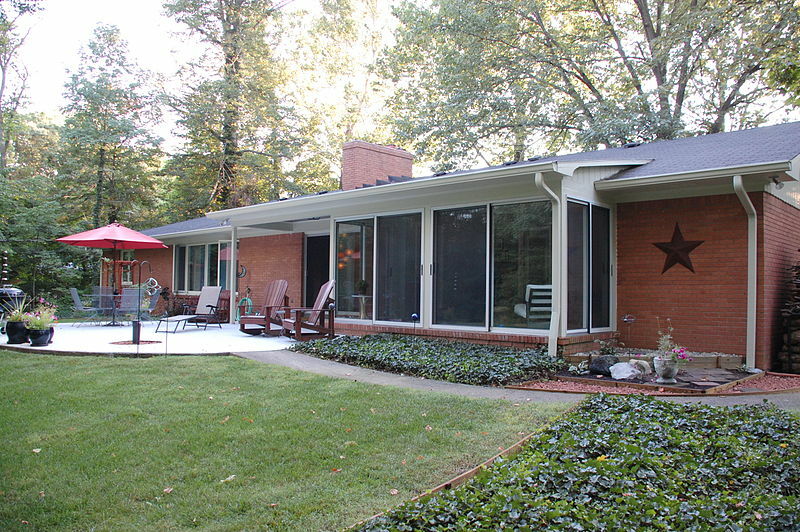 Large windows - often bay windows, but always large to let in lots of light. Minimal exterior decorations - pristine paintwork and a well cared for garden are all a Ranch house needs. Rear of the house is likely to have sliding doors/French doors leading on to a patio. 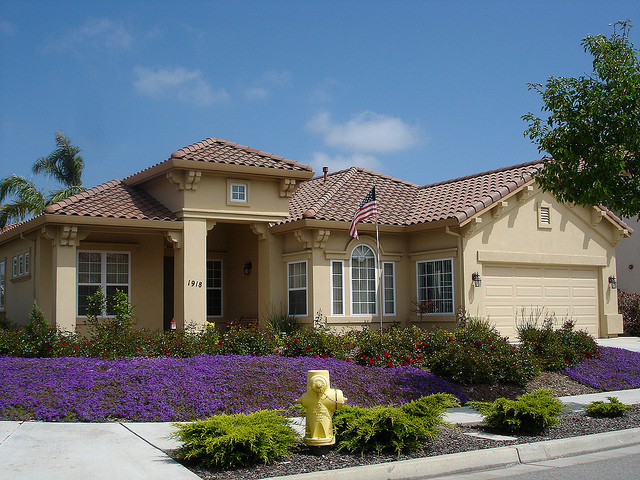 Often a big contrast between exterior house color and roof color - a cream color house with a red tiled roof, is a popular look. Wherever you find a Ranch style home it always has that taste of the American West. If you have a Ranch style home and want to add some "wow" factor to the exterior, to boost its curb appeal, then it's not that difficult to do. Depending on your budget, you might want to consider some of the following renovations when remodelling a Ranch style home. Use stucco or plaster to cover exposed brick, or give it a good sandblast and an exterior paint job; cream, beige and lemon yellow colors work well, but make sure they have a warmth to them. Replace windows with larger bay ones if possible; even if you only use them in a couple of places, it makes a huge difference. If you have a larger budget, consider adding a second story, or add gabled dormers if you already have a multi-story Ranch house. Update the entry way by adding a covered foyer, an arch, or install some stairs with a new balustrade. Add stone accents to chimneys and/or bump outs, but remember to keep the look natural. Add stone patio or decking to the rear of your Ranch house. Landscaping can create a perfect frame for your Ranch home, no matter what your budget. Add to a featureless lawn with a rock garden, stone path, or some new trees and shrubs. Don't think of a Ranch style home as boring, think of it as versatile because there's just so much you can do with this classic house design. 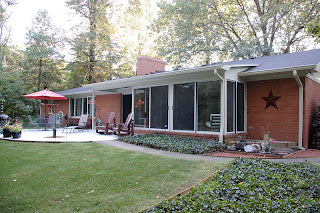 No wonder the Ranch style homes exterior is one of the most popular styles of home today.